From the 9th to 22nd July, Drink Me Chai held their first ever pop-up shop at Old Street Tube Station, London. We interviewed Amanda Hamilton, founder of Drink Me Chai, about how the café went! So this is your first ever pop up café, how do you think it has gone so far? It’s been a fantastic experience and the team have pulled out all the stops to make it a success. With the 4D experience of smell, taste, visual and the VR trip on a TUK TUK in India it has really engaged customers. 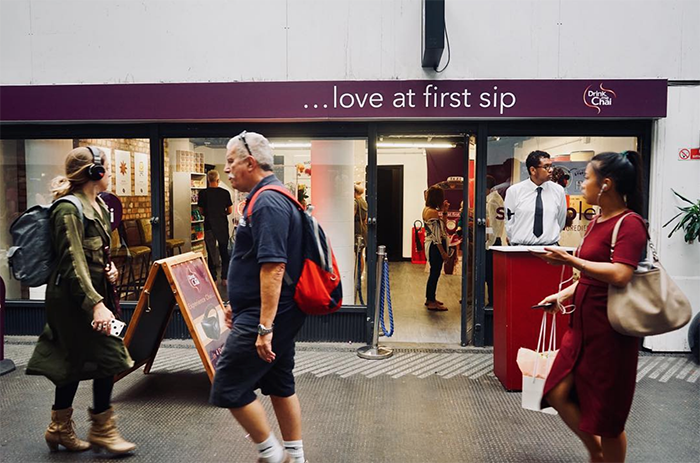 The location is key and at Old Street Station there is such a busy mix of interesting people who seem to love our range of Chai, Superblends and delicious eats. We will be sad when move on but watch out for the next pop up café! So what drinks are you doing here at the 4d café? Well we thought of the pop up café idea because we now not only sell Chai latte but we are now launching our range of Superblends. They consist of raw cacao, beetroot, turmeric and naked chai blends which are vegan and can be used with any plant based milks. We are also delighted to be partnering with Alpro soya and can recommend any of their range works so well for Superlattes. You can also use these blends for baking so here at the café we have been selling our gorgeous bliss balls, millionaire shortbread using the beetroot powder and we have also made delicious granola. These have been going down so well mornings with some coconut yogurt from the Coconut Collaborative and fresh berries. We have cinnamon incense burning and our exciting VR experience which takes you through a ride on a TUK TUK in a busy Indian street. Where can we buy these Superblends? We sell the Turmeric in Waitrose and selected Sainsburys stores and the Beetroot and Raw Cacao will be going into Waitrose from 27th July as well as other outlets online. We also have wholesale bags for cafés that wish to sell on their menus. What’s the vision you have for Drink Me Chai going forward? To carry on making innovative and delicious chai and super blends and be at the forefront of new and exciting café style drinks. We are looking at our food range, merchandise and perhaps one day we may open a permanent Drink Me Chai café somewhere!